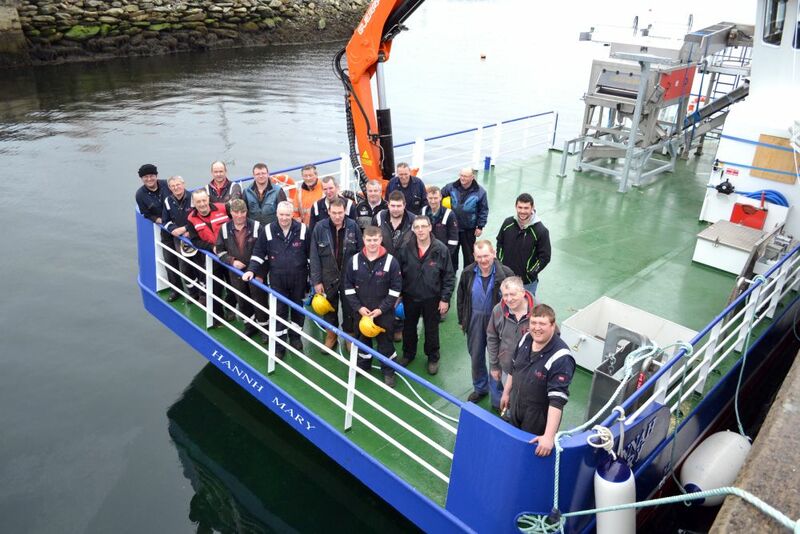 Mooney Boats Ltd Killybegs delivered a new 17m vessel “MV Hannah Mary” to Rodeen Fish Farms Ltd. 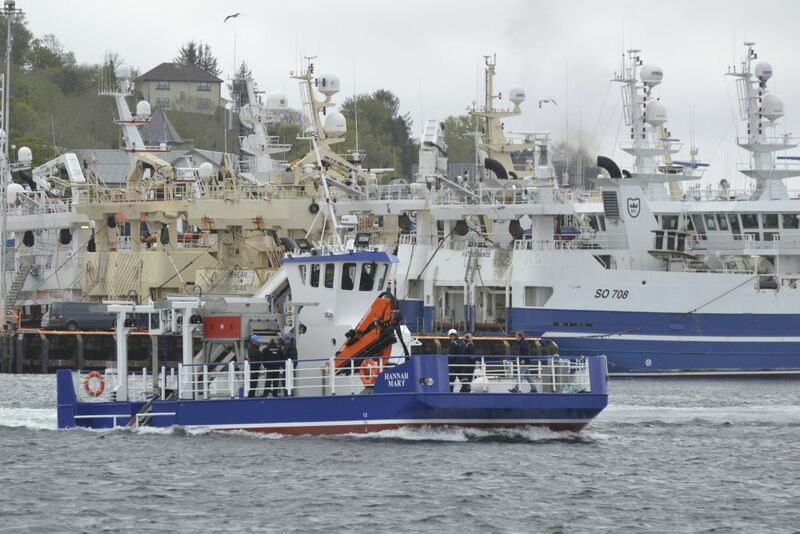 The vessel departed Killybegs on Sunday the 19th of May 2013 at 10am and arrived in her new home port of Castletownbere at 10pm on Monday 20th May 2013. The managing director of Rodeen is Richard Murphy, who is well known throughout the industry through the family’s other company Shellfish De La Mer also based in Castletownbere. 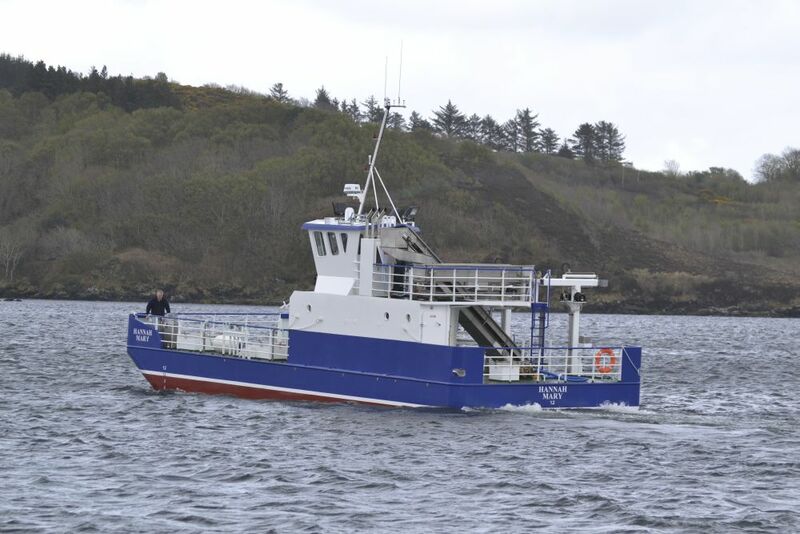 Richard’s brother William had a vessel built at Mooney Boats Ltd in 2006 and he had heard good reports about Mooney Boats Ltd from both William and other sources in the fishing industry based in Castltownbere. Richard contacted Lee Mooney in May 2012 and asked him would he be interested in submitting a tender price for a new Line Mussel Harvester. 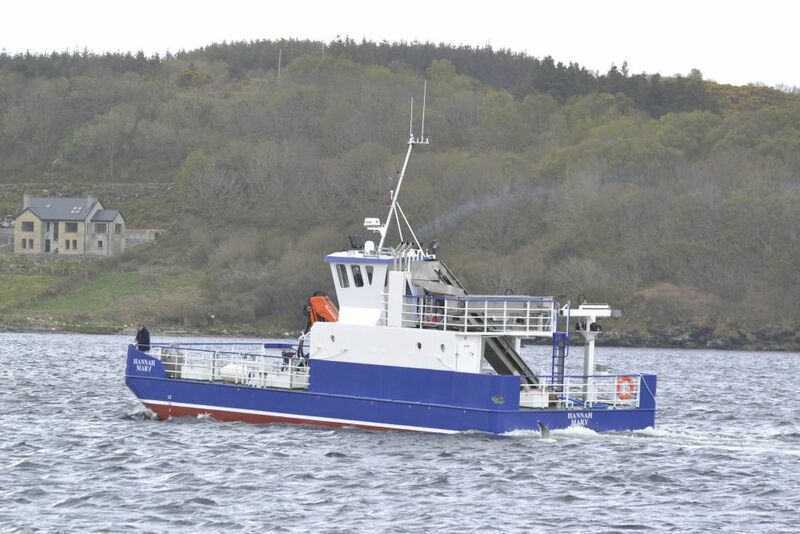 Ian Paton from S.C Mc Allister & Co Ltd prepared a full tender specification and drawings for Rodeens new vessel and Mooney Boats Ltd submitted there offer in September 2012. 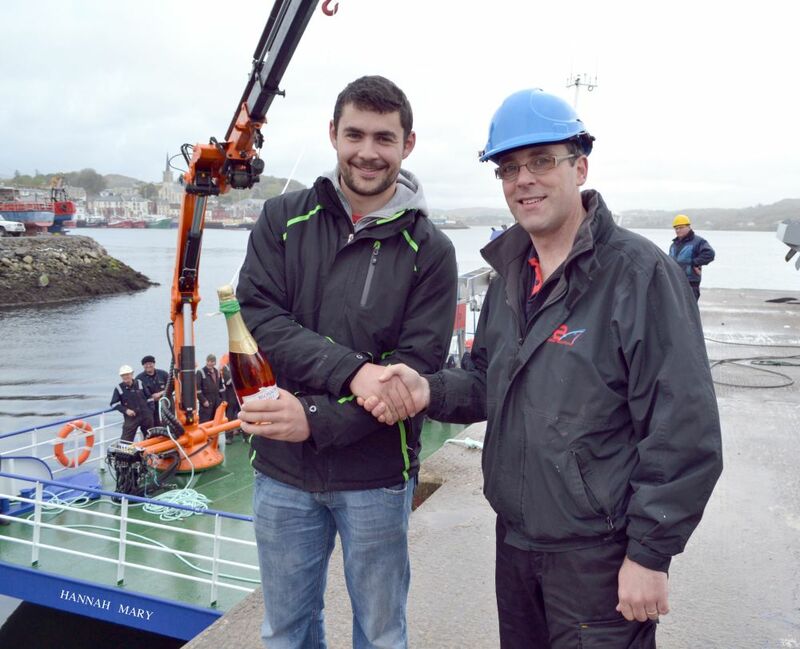 On the 16th October 2012 Lee Mooney was informed by the Richard that Mooney Boats Ltd were the chosen yard to build his vessel. 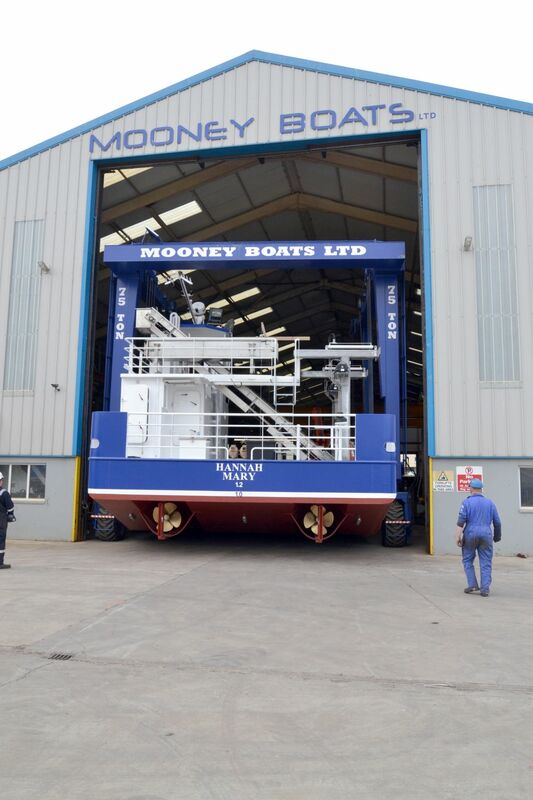 Mooney Boats Ltd committed to have the vessel completed by May 2013 as Rodeen were anxious to have the new vessel in May as this would be there Mussel harvesting season. 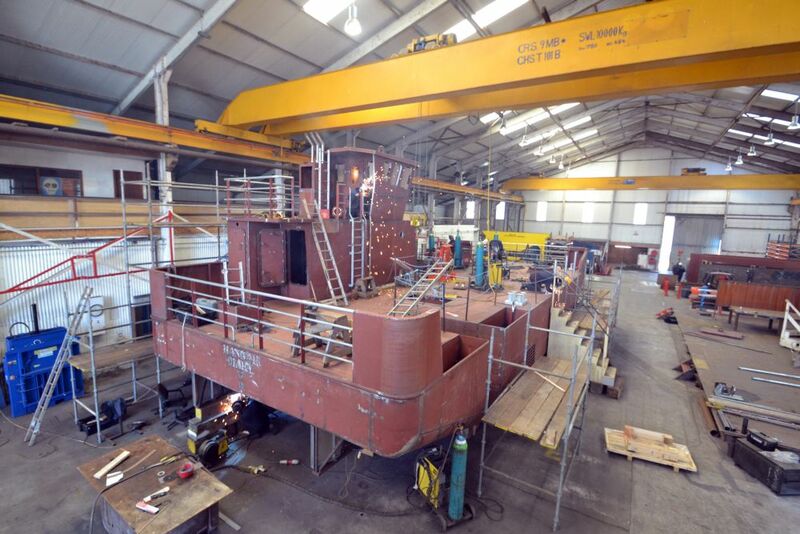 The Dimension of the new “MV Hannah Mary” are 17m long by 6.8m beam x 1.8m deep with a draft of approximately 1m at the stern and 0.4m forward. There are 2 recessed well decks on the starboard side of the vessel approx 2m long each with the stripper conveyor belt in the middle. The well decks were designed specifically to meet the requirements of the Rodeens operators and the yard put allot of time and effort into this area of the vessel to meet the exact requirements. 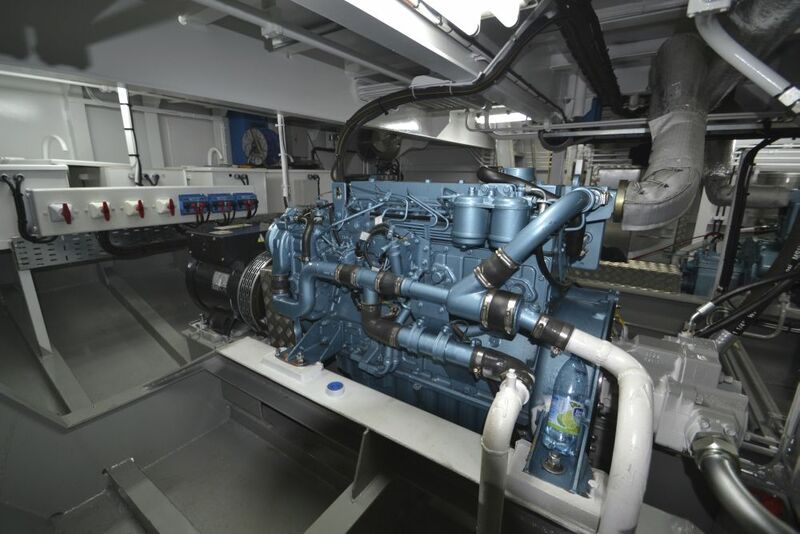 The 2 main engines are Perkins Saber M130 C‘s coupled to a PRM 750 Gearbox 2.9:1 reduction. The auxiliary engine is also a Perkins M130 C which was supplied as a bare unit with a SAE 3 flywheel housing on one end a PTO shaft on the other end. Mooney Boats then coupled the hydraulic pump to the SAE 3 hosing for driving the hydraulic and fitted a 40 KVA shaft generator on the PTO shaft end to drive 220/380 Volt power on the vessel which set at 1500 rpm. 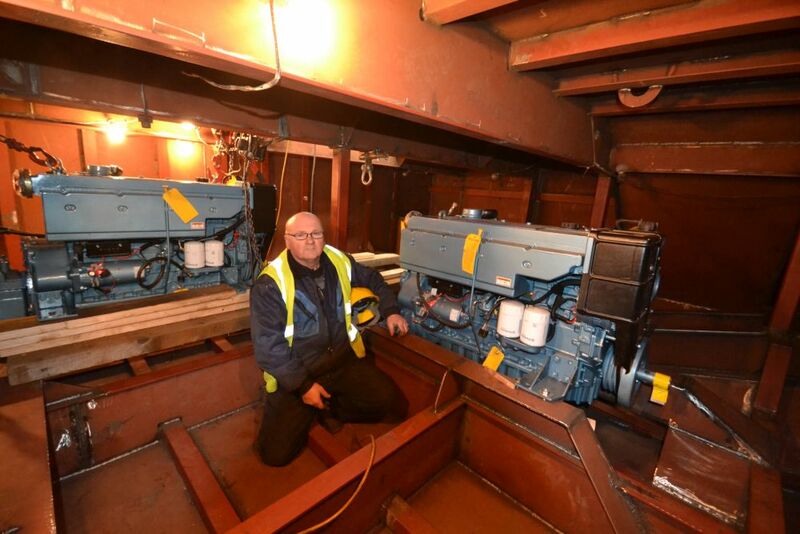 All 3 engines were fitted with individual KLIMA Boxcoolers so there are no sea-inlets into the vessel at all. The coolers for the auxiliary engine and the starboard main engine are zero knot coolers which allow the engines to operate under full load at zero knots if required. There was also a 4th KLIMA Boxcooler supplied for cooling the hydraulic system. The coolers are recessed into the side of the vessel so they cannot get damaged with removable plates for washing each cooler while the vessel is in dry-docked. The Stern gear for the vessel includes 2 x 75ml double tapered tail shafts, approximately 3.5 meters long made from stainless steel duplex. Steel Stern-tubes 127mm diameter x 2500mm welded into the hull and fitted with 1 full length cutlass bearing on aft side and a ½ length bearing on the forward. Shaft seals are 75mm Tides Marine and the yard also supplied a spare seal carrier. The 2 Propellers R/H & L/H are 27.55” x 20.50” 4 Blade. Rudder assembly are 80mm diameter upper stock made from F51 Duplex with 200mm diameter connection flange and emergency tiller square, manganese bronze tiller arm with a lower stock 80mm dia. The rudder blades are made from mild steel plate with 200mm diameter connection flange, mild steel rudder tube 750mm long with LG2 gland, & lower pintle bearing. The tail shafts were also fitted with 2 x model F Spurs cutters to suit 75mm shafts. Around the propeller the yard fabricated protection bars which will allow the vessel to be beached without damaging the propellers. There is a very modern hydraulics system fitted on the vessel as almost all deck machinery is driven from hydraulics. 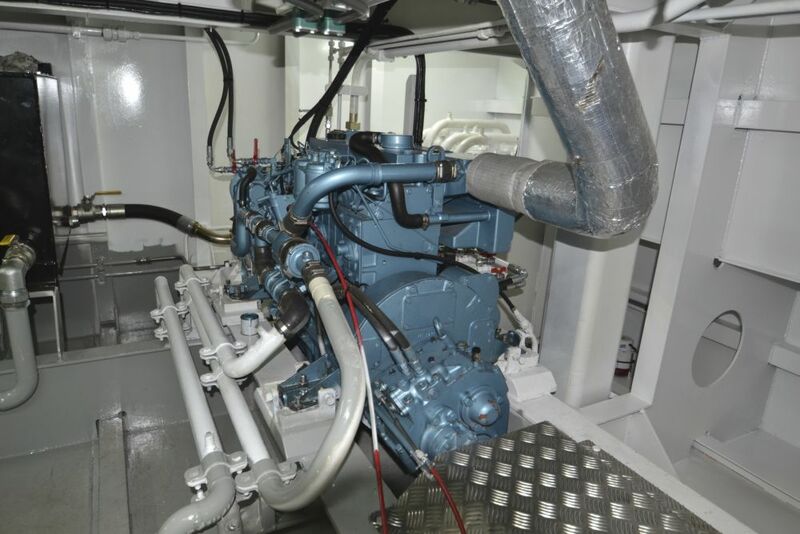 There are 2 Kawasaki 80 cc load sensing hydraulic pumps fitted, one on the front of the auxiliary engine and an identical pump fitted on the starboard main engine as a backup pump. 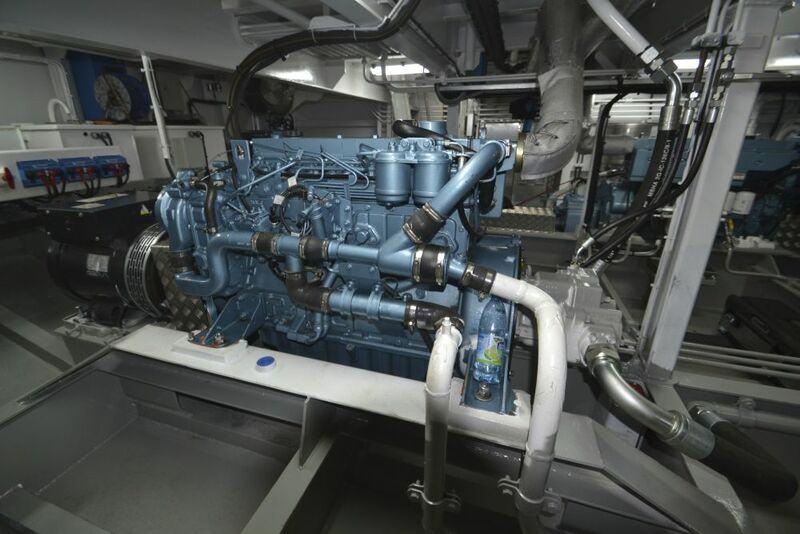 Both pumps can run simultaneously if required or either pump can run separately to drive all hydraulics on the vessel. All the hydraulic piping above the deck is 316L stainless steel as requested by Richard and all below the deck is mild steel hydraulic piping. Careful consideration was given to the hydraulic piping and almost all piping is below deck and then take up at each location on deck where required. This keeps the deck free from hydraulic pipes and leaves it much safer and easier to clean after harvesting. The hydraulic system is a load sensing system with a 13 bank Danfoss hydraulic control valve fitted manufactured inside the aft store room door which has 7 electric modules for controlling various machinery on the deck. 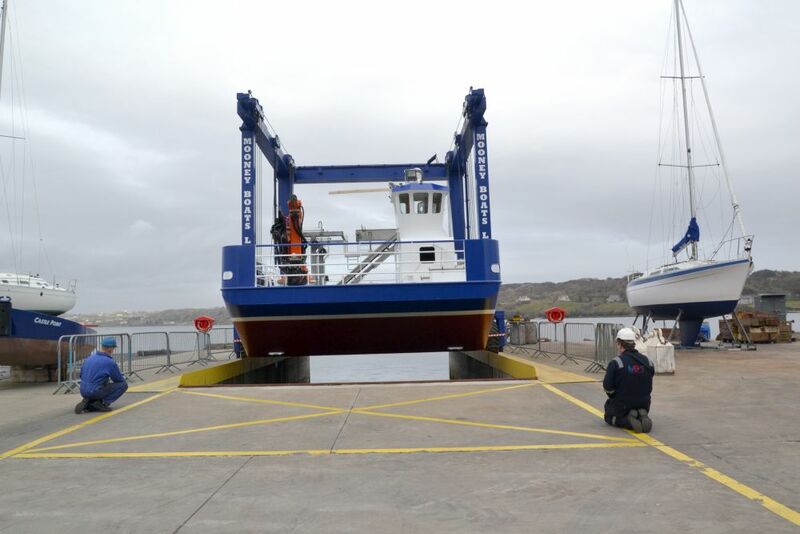 The main hydraulic items on the vessel are 2 Galvanised Steel telescopic davit arms which are fitted with 2 Rotzler 1 Ton winches capable of lifting two lines at a time on each davit arm. 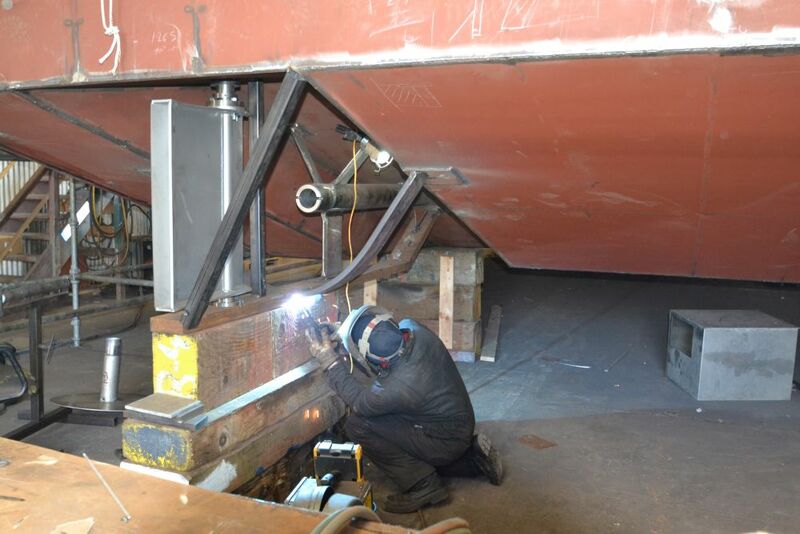 The rams for extending the arms over the side of the vessel are fabricated from stainless steel and have Danfoss Electric control valves fitted at the base of each Davit arm which allows the crew to operate either davit arms from either well deck. The electrically controlled joy-sticks have an IP 67 rating as there are mounted externally. Mooney boats supplied 3 No AM50D hydraulically driven water pumps which have the capacity to pump 48 cubic meters of water per/hr each and this water is used for washing the mussels, going to the grading machine and also for the deck wash. Rodeen did not want any of the suctions for the pumps going through the hull so the yard fitted each pump with a separate flexible suction hose. Each suction hose was then fitted with stainless steel filters manufactured by the yard. Each water pump can be set individually to the required flow through the Danfoss control valves fitted inside the deckhouse. The main other hydraulic items are the 2 conveyor belts which were supplied by Little Island Engineering Ltd in Cork. 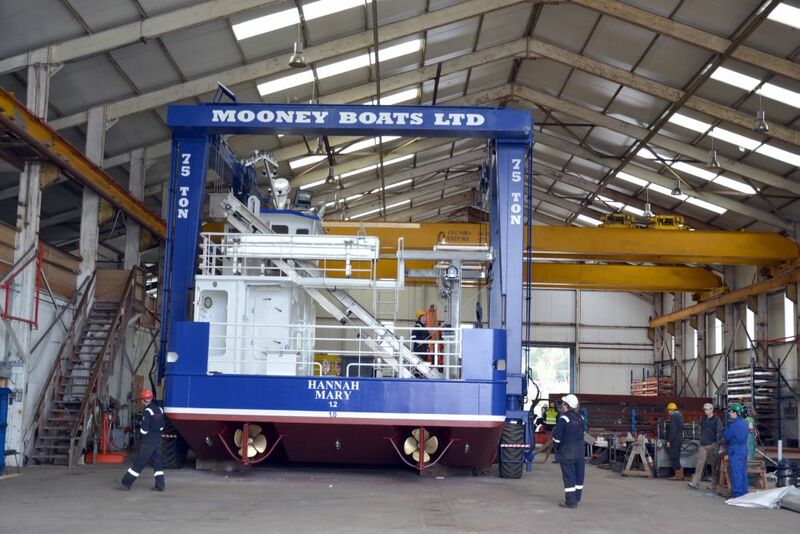 Mooney Boats Ltd supplied a Guerra Marine Crane Model M230 A5 which can lift 1200 kilos at 13.6 m reach and is fitted with a separate winch and a radio remote control which means the crew can operate the crane from anywhere on the vessel or even the quay wall. The steering system on the vessel is a LS Power assisted steering system. It’s a separate system to all other hydraulics and has 24 Volt hydraulic driven pump for the power steering with a traditional orbital pump & steering wheel fitted in the wheelhouse. The vessel can be controlled from the wheelhouse and also with the second control station at the well deck which means the crew can drive and control the engine from the well-deck which allows them to move along the mussel line without having to go to the wheelhouse. 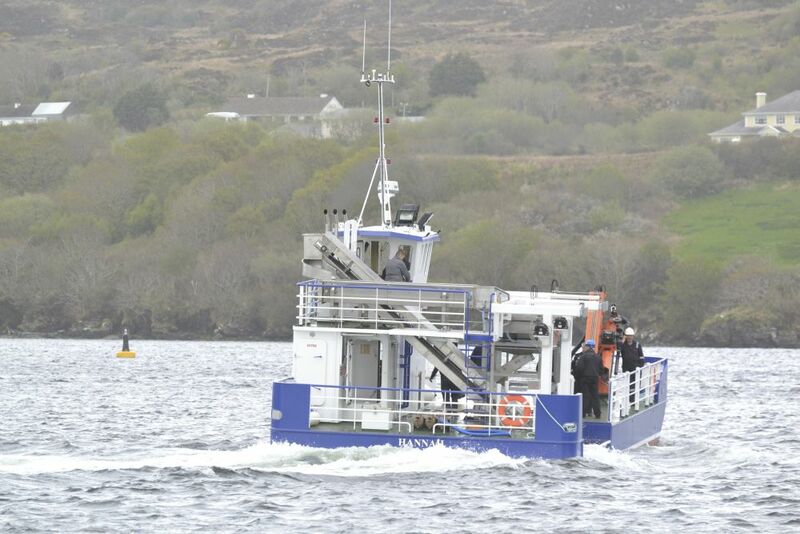 The Wheelhouse electronics were supplied by Jonathan Kennedy of “Marine Fleet Electronics Limited” from Killybegs. The wheelhouse electronics included the following 1 x Simrad NSE12 12” Multifunction display, 1 x Simrad Radome 3G Broadband radar 1 x Simrad BSM Black box sounder module, 1 x Simrad AC 12 Autopilot computer for use with G isolated solenoid valves 1 x Simrad AP 24 Autopilot Control unit 1 x Simrad RC 42 Rate compass for high speed heading 1 x Simrad RF 300 Autopilot rudder feedback unit 1 x Simrad Sonic Hub Integrated AM/FM radio with iPhone docking station and USB for movies, photos & Music, 1 x Simrad GS 15 Smart GPS antenna, 1 x Simrad EP 50 EPIRB with automatic release, 1 x Koden KGP913 MKII and 1 x Lowrance LVR 880E VHF. Mooney Boats Ltd electrical engineers completed all the wiring on the vessel. The vessel was fitted with LED deck lighting on the wheelhouse roof externally and also on the davit arms. Internally in the wheelhouse galley and toilet there was also LED deck lighting used. In the engineroom fluorescent lighting was used and also in all void compartments below deck. 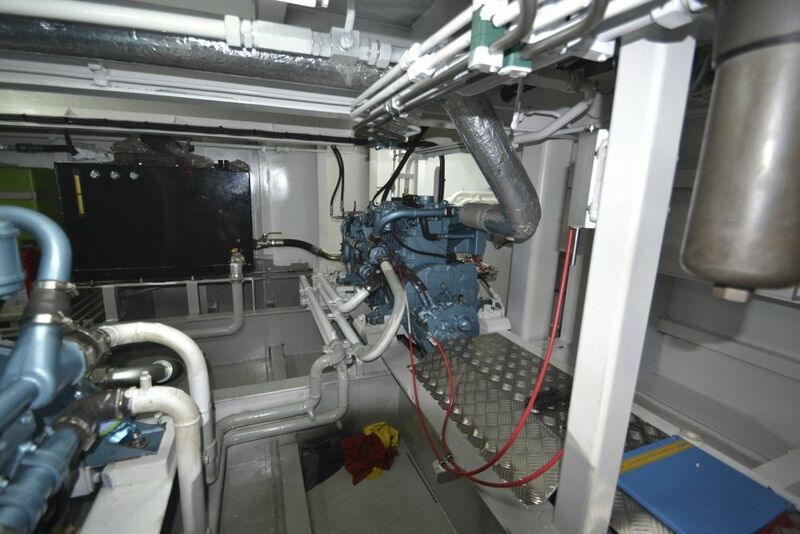 Galley was fitted with all the mode cons including microwave electric hob, electric heating and hot and cold running water from the Isotemp 24L water heater which is fitted in the engine room with a 170lt water tank and separate 24 volt Jabsco water pump. The toilet is an electric Jabsco 24 volt model which is accessible of the main deck in separate area. The wheelhouse on the vessel was offset to the port side of the vessel and was fitted on top of the deckhouse. This allowed more working space on the main deck for the crew to store there mussel’s bags. The wheelhouse is fitted with windows all around which give clear vision to all areas on deck with drop sliding windows port and starboard. 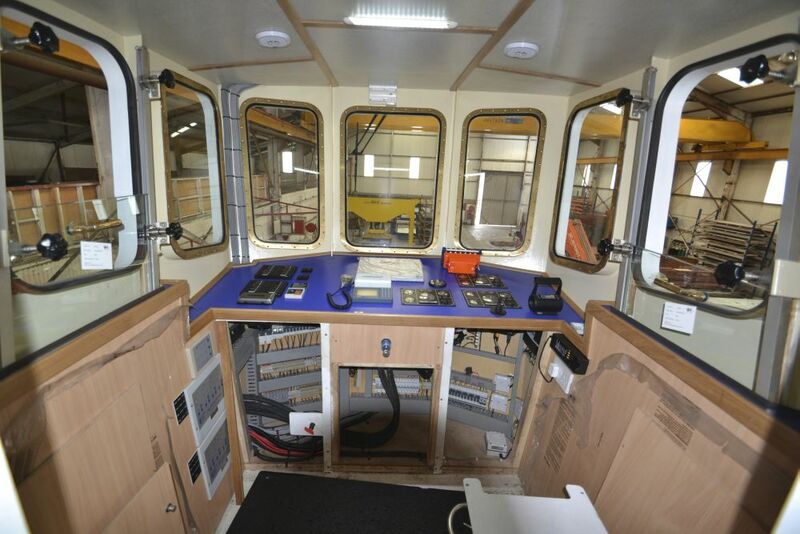 There is a KAB 300 situated in the wheelhouse and all controls are at the fingertips of the operator. 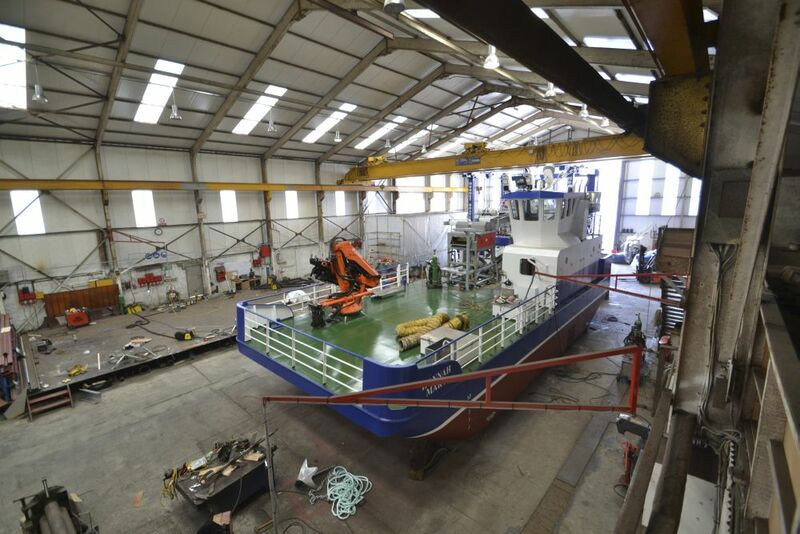 On completion the vessel was painted inside & out with a Jotun 2 pack paint system applied by Gerard Bray & Sons Ltd. The yard also fitted a 2 year MG Duff Cathodic protection system on the vessel. After the vessel arrival into Castletownbere on Monday night 20th May the “Hannah Mary’s” crew along with Mooney Boats Ltd engineers who delivered the vessel meet up on the vessel at 6am Tuesday 21st May and went out to Rodeen Fish Farms where they successfully harvested 8 ton of mussels that morning and everything worked perfectly. 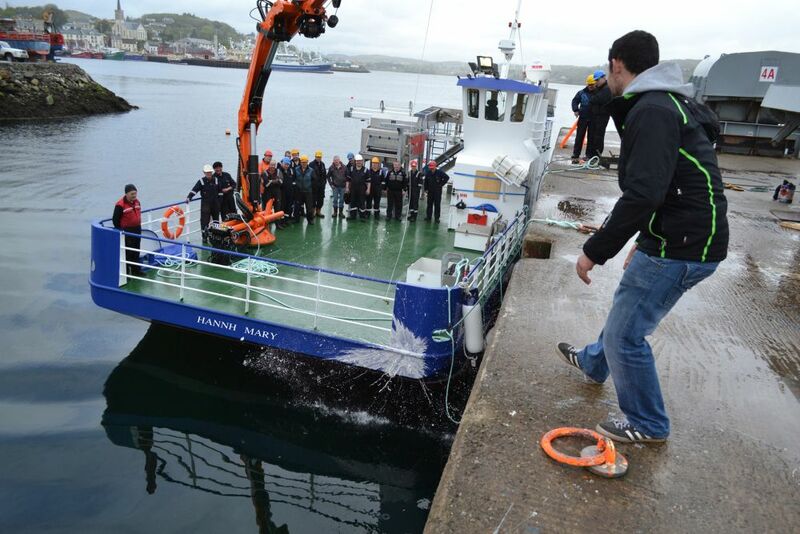 This “Hannah Mary” is a very modern Line Mussel Harvesting vessel and has been fitted out to the highest standards. Rodeen Fish Farms Ltd worked closely with the yard during the build to get everything specifically the way they wanted it. 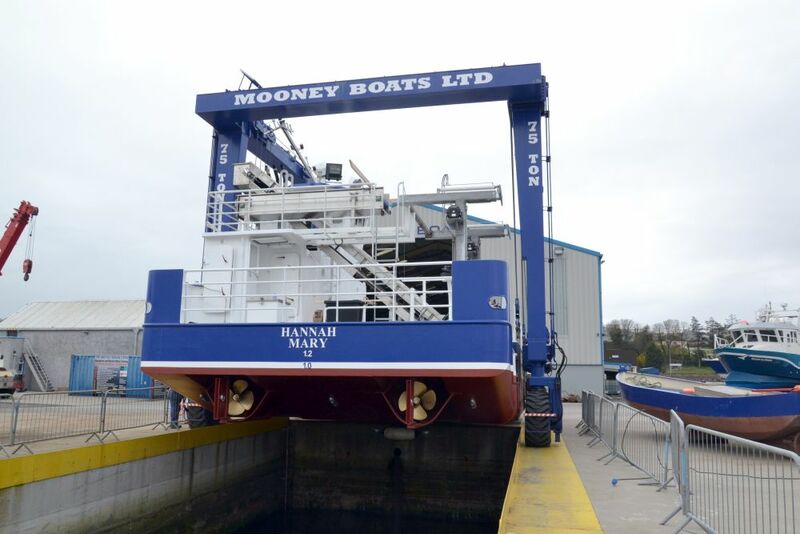 Mooney Boats Ltd management and staff would like to that Richard Murphy, his family and all the staff for choosing there yard to build the Hannah Mary and wish them continued success in the future.